Sundays are meant to be easy, and I’m all about easy (projects, that is). I typically tackle laundry and cleaning on Sundays, even though I’d love to find the time to do these chores during the week to free up my weekends for fun. 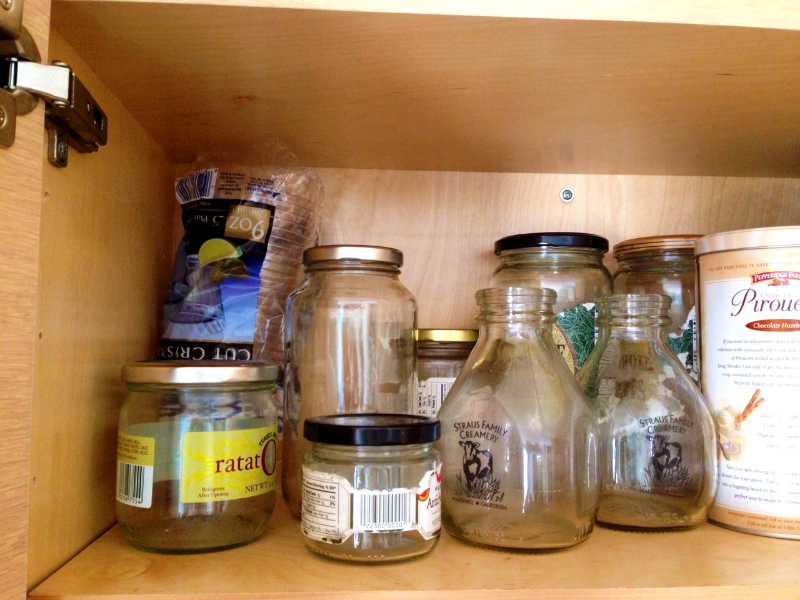 A cabinet full of empty jars was my motivation for today’s project. It was time to clear out the clutter. I really didn’t want to keep seeing this…. ….for the next 2 years. Since I’m a sucker for succulents, I decided to turn a chore into a fun little project. 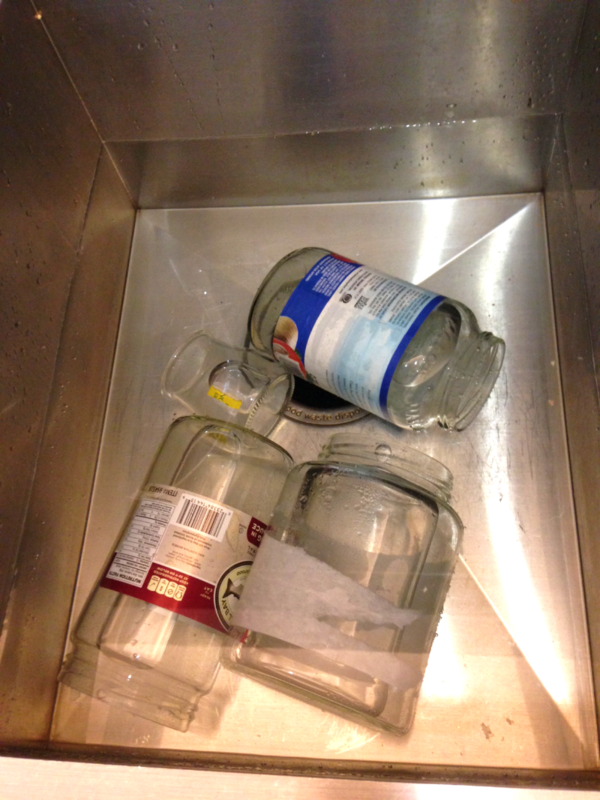 First, you have to remove those stubborn labels by soaking the jars for a LONG time. Mine enjoyed the bath for about 4 hours. Make sure that the water is warm. I still had to scrub the labels off, but it was pretty easy. 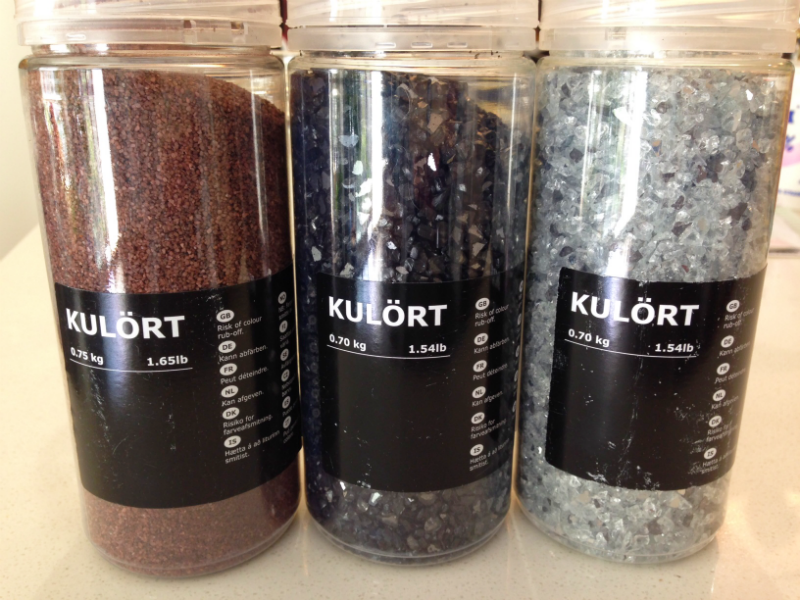 I bought these broken glass pieces at IKEA for $2.99 each. You can also get ’em at a craft store like Michaels, or at an aquarium supply store in Chinatown, SF (I know, random! I just remember seeing colored pebbles for fish tanks and thought at the time they’d be so pretty in clear glass containers for plants). 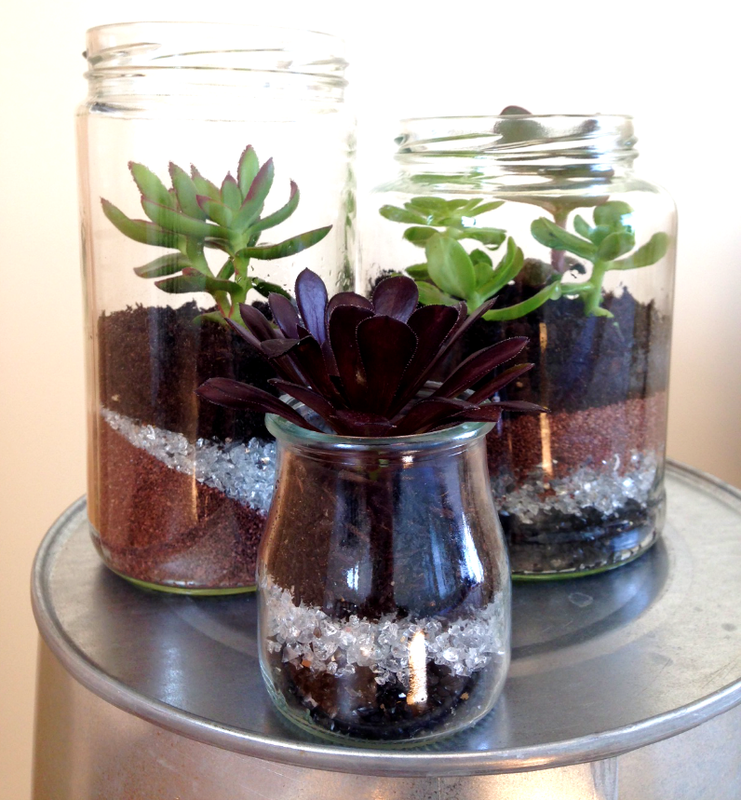 I layered the glass in all the possible combinations I could think of, and topped off each jar with enough soil for the plants to root. Spray the soil with water so that the plants can sit snugly. Tie some twine around the neck, attach a gift tag and voila! A gorgeous homemade pressie for a lucky recipient. All in all, it took less time than a trip to the bathroom after a meal at La Taqueria. And the process wasn’t in the least bit jarring. Hilarious reference! Love them. Good gift idea! And so easy!! It’s crafting dummy proof! That plug was as smooth as it was shameless. Haha! But – the best yogurt I’ve ever had was in Paris, so if your hubby’s is that good, he’s on to something. Sadly I don’t live near one of those stores. Well, hubby is from France (and Poland) and it’s very close to the yogurt he was eating there. It’s a Sonoma company (not hubby’s – Credibles is hubby’s co.) but they sell it at all the Whole Foods. If you’re close to a Whole Foods, try it out!